SANTA FE, N.M. -- Santa Fe Natural Tobacco Co. will update its packaging for Natural American Spirit cigarettes after a revision of the terms that can legally be used to describe tobacco products. Beginning this month, packaging and advertising for Natural American Spirit (NAS) cigarettes will no longer describe the product as “additive-free” or “natural.” Instead, new language will be used to make adult smokers aware that the brand’s premium, whole-leaf tobacco blends still contain just two ingredients: tobacco and water, said the Santa Fe, N.M.-based company. The changes came about after legal wrangling and a formal agreement with the U.S. Food and Drug Administration over the terms possibly being misleading, potentially making people think NAS products were safer than other cigarettes. Under the agreement with the FDA, the name of the company, Santa Fe Natural Tobacco Co., and the name of the brand, Natural American Spirit, will stay the same. In addition to new packaging and advertising for NAS cigarettes no longer using the words “natural” or “additive-free” as of Oct. 1, all packaging for non-menthol styles of NAS cigarettes will use the phrase “Tobacco Ingredients: Tobacco & Water.” The brand’s two menthol styles will use a similar disclosure. “We’re also producing new advertising and point-of-sale materials that are based on the theme ‘Real. Simple. 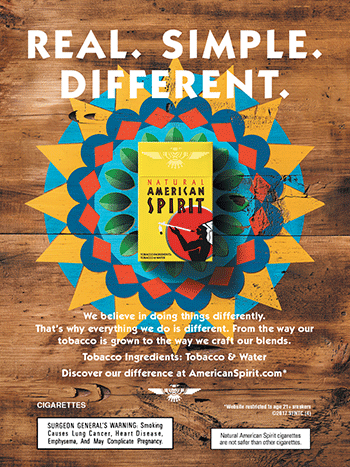 Different.’ Those three words describe what the Natural American Spirit brand is all about,” Calderon said. Products featuring the new packaging have already been shipped, Calderon said, and members of marketing arm Winston-Salem, N.C.-based RAI Trade Marketing Co.’s field marketing team will replace existing NAS point-of-sale (POS) materials with updated materials during their regular retail calls. In the meantime, wholesalers and retailers can continue to sell any NAS products they already have in stock, and they can continue to use the POS materials that are already in place, the company said. Santa Fe Natural Tobacco Co. Inc. is a subsidiary of Reynolds American Inc., Winston-Salem, N.C., which is an indirect, wholly owned subsidiary of London-based British American Tobacco.